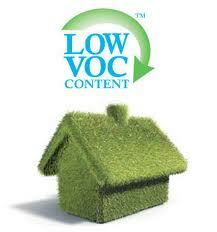 Healthy, comfortable homes that are energy efficient and environmentally conscious. LVS Homes utilizes progressive building techniques to provide homes which are not only energy efficient, but are environmentally conscious and provide a healthier living space for home owners. An Energy Efficient home not only lowers your utility bills but helps preserve the environment by placing a smaller demand on energy resources. By using the latest technologies such as Solar, Geothermal Heating/AC Systems, Renewable Flooring/Cork an LVS built home can help reduce your energy demand, keeping utility bills down and protecting the environment. Cellulose insulation is a non-toxic natural product made from at least 80% recovered, post-consumer paper fiber, reducing landfill waste while maintaining superior R-value and fire retardant properties. 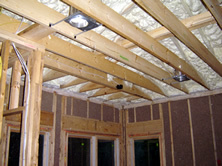 (Left)Cellulose insulation in walls and Icynene foam in ceiling. By using products with a lower amount of chemicals called VOCs (Volatile Organic Compounds) there is less "off-gassing" of toxic components which evaporate into the air and can harm the health of the occupants as well as the environment. 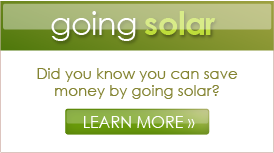 The use of solar energy is easily adaptable to any home. Solar powered features can be added to existing homes or in-corporated into your new home design.